This mastectomy specimen demonstrates the gross findings of "inflammatory" carcinoma of breast. 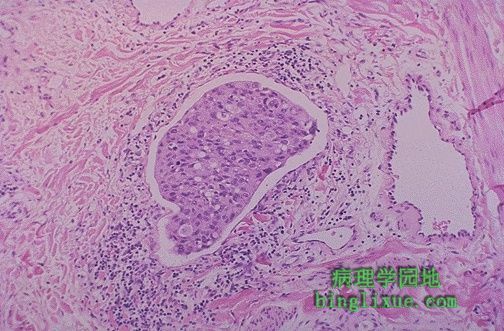 This is not a specific histologic type of breast cancer, but rather it implies dermal lymphatic invasion by some type of underlying breast carcinoma. 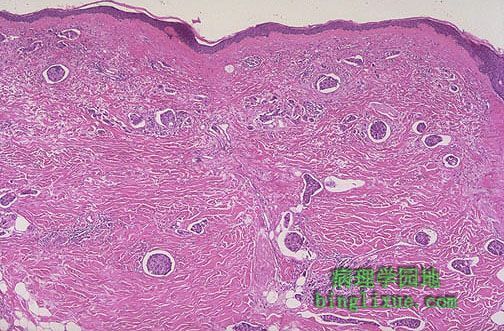 Such involvement of dermal lymphatics gives the grossly thickened, erythematous, and rough skin surface with the appearance of an orange peel ("peau d'orange" for you francophiles). The skin overlying the breast has prominent lymphatic spaces filled with small metastases from breast carcinoma. Carcinomas often metastasize to lymphatics. Breast cancers most often metastasize to the axillary lymph nodes, and these nodes are often removed at the time of surgery for breast cancer. The microscopic appearance of a dermal lymphatic distended by ductal carcinoma of the breast is shown here. This is the hallmark of so-called inflammatory carcinoma of the breast.